A two-section module, the 9746 features two sets of patch points for combining or splitting signals within a system. Passive (non-powered) combinations or splits can be made via multiple 1/8" phone jacks (tip-ring-sleeve (TRS) phone, aka 3.5mm stereo) and 1/4" stereo phone jacks. 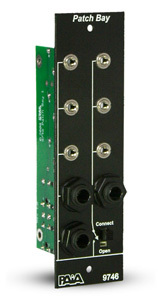 The patch bay can be used to adapt patches from one size connector to the other. One section links three 1/8" and two 1/4" TRS phone jacks, the other section links three 1/8" and one 1/4" TRS phone jacks with a switch-selectable link to the other section or to a common stereo bus in a system with multiple 9746 modules. To purchase the fully assembled version, view the 9746ASM product page.